It seems that there is no end to the animals that will benefit from 3D printing and now the process has become so common place it is child’s play. Stumpy came to the Oatland Island Wildlife Center in Savannah, Georgia with a bad infection to his right front leg. 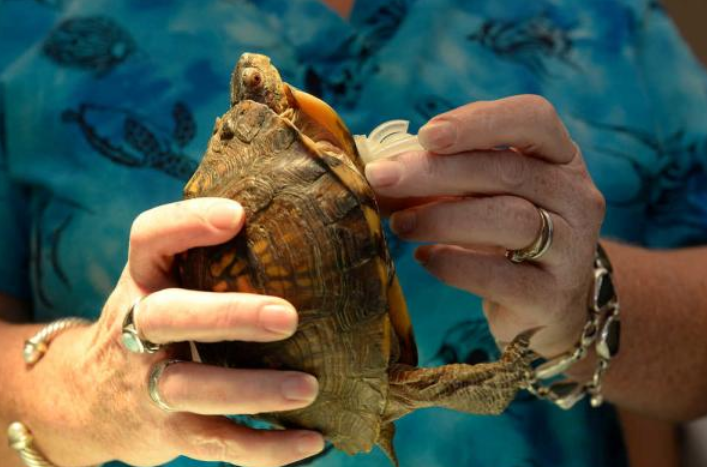 In order to save the 12 year old box turtle veterinarian Lesley Mailer amputated the leg. Stumpy lived, but had a very hard time getting around without his front leg. Luckily for Stumpy, Lesley Mailer remembered her daughter mentioning a 3D printer that her 5th grade class at May Howard Elementary was working with. So Mailer contacted the school about creating a new leg for Stumpy. The school took up the call and choose a few students who were interested in 3D printing and/or animals to work on the project. Six students and a teacher went to work right away to learn about box turtles to understand what Stumpy needed in a new leg. The students were eager to learn and help Stumpy, they spent time after school and during their lunches to design the new leg. Using 3DTin to create 15 prototypes over a month of development the students created a leg that they thought would work for Stumpy. Mailer was just as excited as the students and invited all of them to watch as Stumpy was fitted with his new leg. With just a few minor alterations, Stumpy’s new leg fit perfectly. Now this little box turtle can live out the next 20 to 30 years moving around just as easily as any other turtle. But that doesn’t mean these dedicated students are taking a break, they intend to improve upon their design this year.